Despite the fact that the city of Holon has become quite famous due to its cultural programs and institutions such as the Israeli Center for Digital Art, the Design Museum, the annual summer music camp organized by Daniel Barenboim and the Holon Children´s Museum, there are still neighborhoods which have not received a share of the city´s development yet. With a protest movement starting in Israel in summer 2011 citizens expressed their demand for a more just distribution of resources. Also in Jessy Cohen neighborhood demonstrations took place, claiming the lack of sufficient housing opportunities. In many increasingly privatized housing schemes no one feels responsible to maintain the buildings and apartments. Those in need are forced to live under poor and risky conditions. 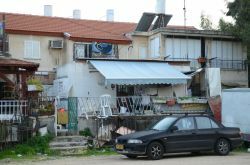 Therefore WochenKlausur decided to set up a structure to provide apartment renovations in the Jessy Cohen neighborhood in Holon, with no cost to residents who can´t afford. The group first started to visit different apartments in order to be able to prepare a list of needed renovations. While each apartment manifests various difficulties, there are several general similarities that were observed. The state of the outside of the buildings is poor, there are crumbling facades, gardens that are overgrown, desiccated, or filled with makeshift structures. On the inside most of the apartments had some crumbling walls, water damage and mold in patches or floors cracked. 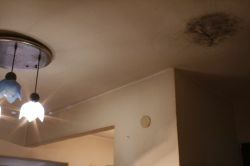 Social workers told that the presence of mold is a common experience. With this information it was possible to find project partners who where willing to donate the necessary material, expertise and time to repair these damages. Partnerships were established with local businesses and professionals. Also community groups, schools and youth groups were asked to participate with volunteer work. Depending on their capabilities and resources these partners form now a network of assistance so that the improvements can be made without costs for those in need. To manage this network and to organize the necessary renovations it was important to found a position for a coordinator. This position, now run by the Israeli Center for Digital Art in cooperation with the local Community Center, is in place since February 2012. 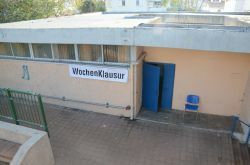 Furthermore WochenKlausur established a committee as an assisting structure to the coordinator and responsible to develop criteria for prioritizing possible renovations. Membership includes the local Community Center, the Center for Digital Art, the Municipal Social Welfare Department and a representative from the public housing company. They meet periodically to review the apartments and needed improvements.